This section explains recent coverage—and why it is important if you want to qualify for your highest possible Plan benefits. It shows the different types of benefits available with and without recent coverage. This section explains recent coverage and why it’s important if you want to qualify for your highest possible Plan benefits. You need to understand the different types of benefits available with and without recent coverage. Recent coverage affects more than just your benefit amount. It’s one of the key requirements for qualifying for a higher early retirement benefit, PEER benefit, disability benefit and certain death benefits. 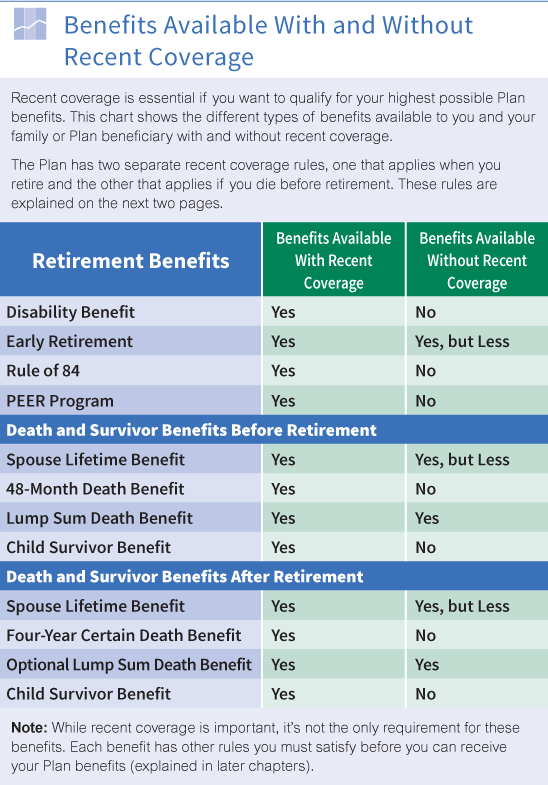 Click here for a chart that highlights many ways that recent coverage impacts the Plan benefits that you or your survivors may receive. Note: If you leave covered employment or go on a reduced work schedule before benefits begin, you can lose recent coverage. Without it, you may not qualify for some Plan benefits or get the most out of the Plan for your covered employment (even if you’re vested). For example, you would not be eligible for disability retirement benefits and would have lower early retirement benefits. To understand the recent coverage rules, you need to first become familiar with four important terms (explained next). A period of 60 consecutive calendar months. You earn a year of contributory service each year you work at least 500 covered hours. Usually, your earliest retirement date is your 55th birthday. However, if you are not vested when you reach age 55, your earliest retirement date is postponed until the end of the month in which you vest. Under the Rule of 84 and PEER, your earliest retirement date can be before age 55. If you become totally and permanently disabled before age 55, your earliest retirement date may depend on your disability onset date. Your pension effective date is the date when your Plan benefits are first payable. It must be the first day of a calendar month. Click here for details about choosing a pension effective date. Recent coverage is essential if you want to qualify for your highest possible Plan benefits. Click here to see the different types of benefits available to you and your family or Plan beneficiary with and without recent coverage. In general, you have recent coverage if you work at least 1,500 covered hours during the 60-month period ending just before your pension effective date (or ending with the month of your death if before retirement). If you have recent coverage when you complete 25 years of contributory service, it’s yours for good. You have locked in your recent coverage protection. You can’t lose it by going on a reduced work schedule or leaving covered employment entirely. This is true even if you are many years away from retirement. Click here for an example of how you meet the recent coverage rule on your earliest retirement date. Click here to see how you can lock in your recent coverage after you complete 25 years of contributory service. Note: If you do not meet the recent coverage rules described here and you work under a pension agreement that requires contributions for all compensable hours up to an annual maximum, a special rule may apply to you. You can find out if you qualify for this special rule by contacting your Administrative Office. Many of your Plan’s retirement and after-retirement death benefits are only available if you have recent coverage at retirement. Click here to see the different types of benefits available to your family or Plan beneficiary with and without recent coverage. Here are the three ways you can have recent coverage at retirement. Once you meet any one of them, your recent coverage cannot be lost. You have 1,500 covered hours in the 60-month period ending just before your earliest retirement date. You have 1,500 covered hours in the 60-month period ending just before your pension effective date. You have 1,500 covered hours in any 60-month period ending on or after you complete 25 years of contributory service. Note: There are additional recent coverage rules if you are applying for a disability retirement benefit. If you die before retirement, many of your Plan’s death and survivor benefits are only available to your family and Plan beneficiary if you have recent coverage when you die. Click here to see the different types of benefits available to your family or Plan beneficiary if you die with and without recent coverage. You have 1,500 covered hours in the 60-month period ending with the month that begins just before your earliest retirement date. As long as you continue to work at least 500 covered hours each calendar year until your earliest retirement date, you won’t lose your recent coverage. Check with your Administrative Office about your exact situation. Click here for questions and answers about Recent Coverage.